This feels a little like a PSA, but I thought this was a really nice list that one can go through and then take to their doctor because it covers some things not everyone would think of to talk about with their GI doctor. This is the worst part when I accidentally ingest gluten and absolutely the hardest thing to explain to people who don’t have a gluten issue~ the ‘brain fog’. This article adds to growing research into an often cited but hard to study complaint of brain fog in celiacs and those gluten intolerant. They liken the brain fog to a .05 blood alcohol level, which is an interesting attempt to try to wrap some definition around something as hard to grasp as ‘fog’ but I would classify it as that feeling when you are getting sick and feverish and your brain just feels like it needs a nap before computing, but maybe that’s because gluten makes me tired, oh so tired, and so all I think about are naps. Probably everyone experiences it a bit differently, but it certainly points to early detection being more and more important if we want our children to have the best experience as possible in school. The article notes that they are still not sure why that happens since one theory was a lack of micronutrients making it to the brain when the digestive system is impaired, but that did not in fact seem to be the case. Another theory has to do with the gut bacteria, always super important when talking about brain health, but it could also be the gluten itself. Whatever it is, I’m just glad enough people have cited the issued that it’s being studied. 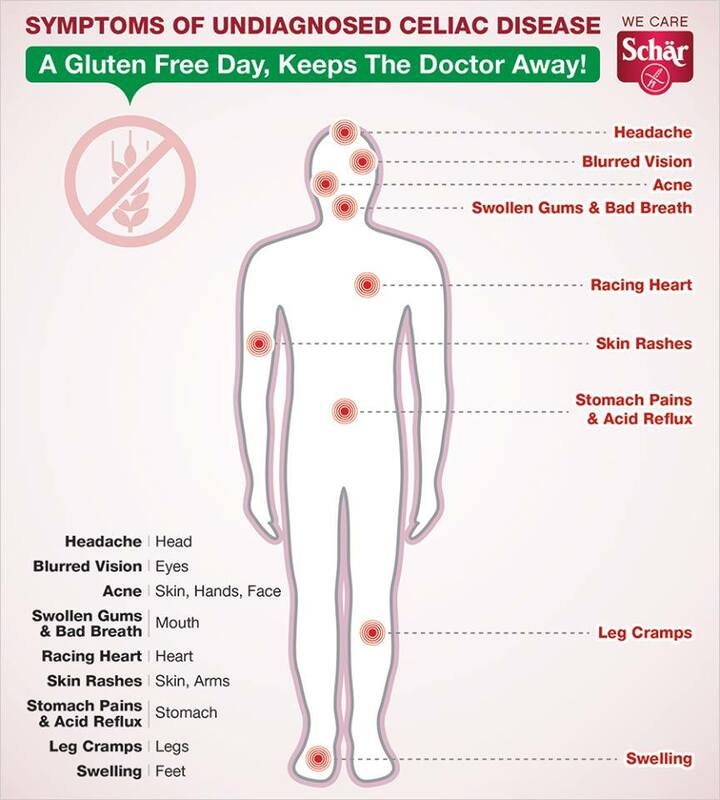 Schar just shared this infographic on their Facebook page. If you don’t already follow them, I heartily recommend doing so if you like nice visuals along with your gluten-free tidbits. And if you are planning a visit to Italy, this is definitely a company to know because as I understand it, they have played a major role in making the land of pasta a safe place for Celiacs and the like. 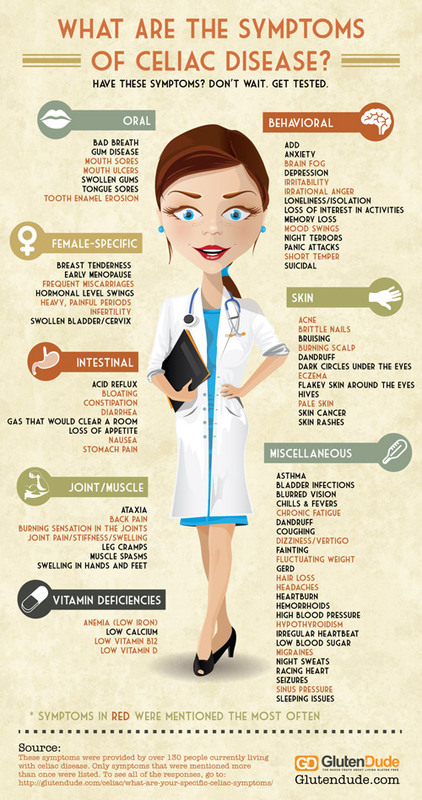 As far as the picture below goes, I can check off more than half those symptoms myself~ how about you? I’ve never been tested for celiac but as a gluten intolerant person, I can attest to a very large proportion of these. A study featured at the International Celiac Disease Symposium looked at neurological dysfunction in celiac disease. More than half of the study’s 73 participants—newly diagnosed adults at a celiac clinic in the U.K.—had neurological symptoms. These included frequent and intractable headaches, balance problems and sensory symptoms. White matter abnormalities were spotted in the brain scans of a number of these participants and some had TG6 antibodies. (TG6 antibodies have been linked to neurological dysfunction in celiac disease.) Findings suggest that neurological dysfunction is common in newly diagnosed celiacs, write researchers. A U.S. study, also featured at ICDS, found that neurocognitive effects like brain fog are common after exposure to gluten in those with celiac disease and non-celiac gluten sensitivity alike. A whopping 89 percent of celiacs and 95 percent of those with non-celiac gluten sensitivity reported experiencing neurocognitive effects due to gluten, specifically, difficulty concentrating, forgetfulness, grogginess, detachment and mental confusion. Symptoms often began 30 minutes to an hour after gluten exposure and lasted several days. Results were based on a preliminary online survey completed by 1,143 individuals with celiac disease and 253 with non-celiac gluten sensitivity. More work is planned. This is the exact article I found in my email box this morning from Living Without. Fascinating.